Effective treatment of alcoholism should work on two aspects, one it controls alcoholism and second it treats the alcohol withdrawal syndrome. Alcohol withdrawal syndrome is the physical and mental symptom a patient suffers from once he starts withdrawing from alcohol. Treatment of alcohol withdrawal syndrome is equally important as treating alcoholism, as more often than not it is the withdrawal symptoms that make the recovering alcoholic to relapse instead of craving for alcohol. 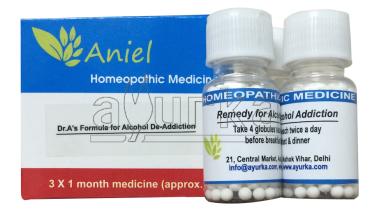 Dr. A’s Homeopathic medicine is an effective medicine to quit alcohol. It works on both the levels of controlling alcoholism and treating alcohol withdrawal syndrome. 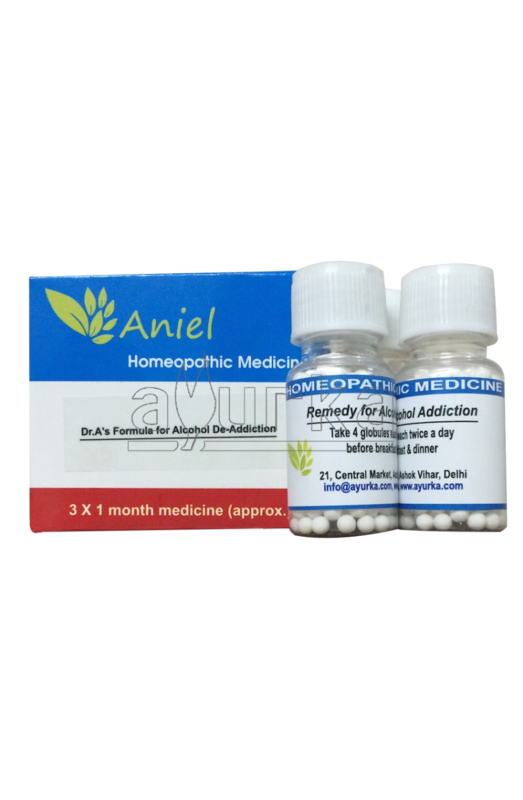 Made from various natural herbs and minerals the medicine effectively prepares mind and body to quit drinking, simultaneously treating withdrawal symptoms like nausea, vomiting, hand tremors, insomnia, restlessness, anxiety, psychomotor agitation and even transient hallucinations. Dried seeds of Strychnos nux-vomica L. (also known as poison nut), indigenous to India and southeast asia. Nux-Vomica counteracts chronic chemical dependency and treats addiction to alcohol, narcotics, coffee and other addictive substances, both chemical and herbal. Sulphur: A natural element existing in mineral form, Homeopathic dilutions derived from Sulphur are useful in treating liver damage associated with alcoholism. Dilution of Sulphuric Acid makes the homeopathic medicine Sulphuricum Acidum. One of the main symptoms of alcohol withdrawal syndrome is tremor and weakness, hot flushes and trembling. All these symptoms along with craving for alcohol are treated by it. 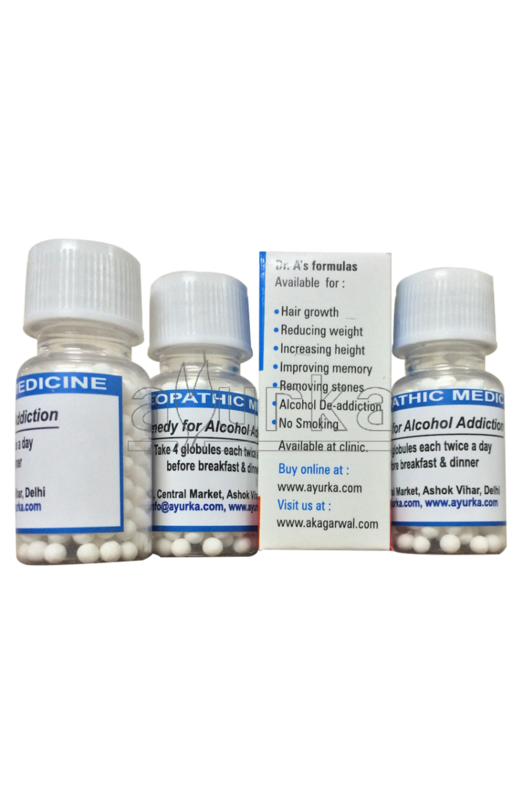 Packing: The homeopathic medicine for alcohol de-addiction is available in 3X1 month packing. 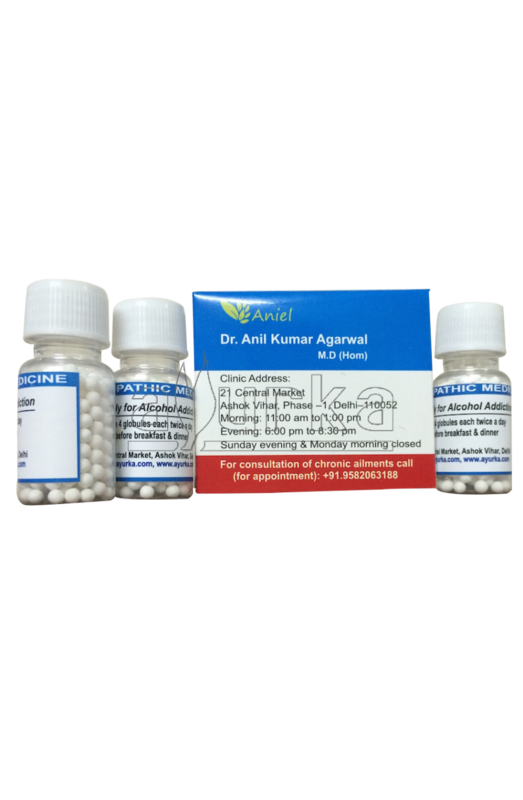 Note: Dr. A’s homeopathic medicine for alcohol de-addiction is free of any steroid or unnatural substances and has no side effects on the body.